Berkeley, CA â€“ 4 January 2011 â€“ The New Year brings a slew of fresh starts and Witchblade bearer, Sara Pezzini, is no exception. Pezzini will start 2012 in Chicago with a new job and brand new life, thanks to the fresh ongoing creative team of Tim Seeley (HACK/SLASH) and Diego Bernard (The Man With No Name). Sara Pezzini has always been a born and bred New York City detective, in addition to wielding the ancient Artifacts, the Witchblade. 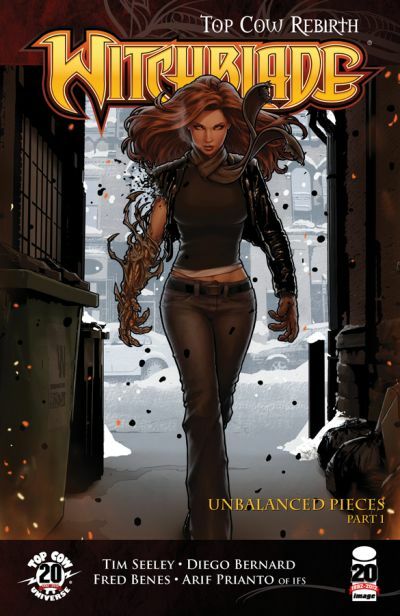 That all changes with WITCHBLADE #151, the first issue by Seeley and Bernard, which finds Pezzini living outside of the Big Apple for the first time in the series history and working as a private detective. The mystery of how and why Sara is in Chicago, as well as what else has changed about her situation, will drive the story and reader interest for the coming year. This issue kicks off the 5-part story arc, entitled â“Unbalanced Pieces,â€ in which Sara must find a way to balance her new role in the Windy City. WITCHBLADE #151 is the first issue in Top Cow’s REBIRTH, an initiative spinning out of the end of the ARTIFACTS event, which concludes in ARTIFACTS #13. REBIRTH will provide ground-level entry points for each of Top Cow’s Universe titles - WITCHBLADE, THE DARKNESS, and ARTIFACTS - and ushers in a bold new age of story-telling to coincide with Top Cow’s 20th Anniversary. In addition to containing the full first story by Seeley and Bernard, the issue will include a five page bridging sequence by Ron Marz (MAGDALENA) and John Tyler Christopher (ARTIFACTS) and an ongoing prose story backup feature by Seeley. WITCHBLADE #151 is a 32-page full-color comic with no ads for $2.99, and will be available in comic stores and digitally today. This issue ships with two wraparound covers by regular cover artist Christopher. For more information, please visit www.topcow.com.